In the world of Ferrari, “affordable” is a very relative term particularly in the classic car market where Ferraris command the highest prices. There are, however, still some good value cars out there. For example, the Ferrari 348TB looks rather attractively priced particularly when viewed against some of its competitors of the time. Often seen as the baby Ferrari of the age, particularly in an era where the F40 was the fastest car in the word and the undisputed king, the 348TB was somewhat overlooked and has remained so for a long while since. Today though the rakish 80s lines reminiscent of the mighty Testarossa are looking ever more fashionable and the “analogue” cars, such as this and the F355 are now considered as some of the best by driving purists. These cars are the last before electronics and paddle-shift gearboxes got in the way of real driving. The 348 we have for sale at The Classic Motor Hub is a fantastic example and is most certainly an affordable Ferrari in , recently serviced and inspected by Bob Houghton Ferrari who have given this car a clean bill of health, testifying that it is one of the most original and well looked after 348TBs they have seen. The 348 is a very useable Ferrari, it does not feel particularly large to drive down narrow roads but the 320bhp quad-cam V8 is plenty fast enough and the transverse gearbox (hence Transversale Berlinetta) gives the car near perfect weight distribution for predicable and balanced handling. The 348 was built with every day use in mind, as such maintenance on these “3 series” cars is refreshingly inexpensive by Ferrari standards. The engine is mounted on a sub-frame for easy removal and jobs such as a cam-belt replacement don’t require the engine out therefore saving on labour. When compared to other sportscars of the period the 348 looks to be really good value, it certainly seems that the magic Ferrari gold dust has not yet settled on this model. The car we offer here is priced at £49,950. A good Honda NSX will cost you anywhere between £50-80,000 while a Porsche 964 in the equivalent condition to this 348 will comfortably set you back £50,000 and a turbo model would be much nearer £130,000. However, the 348 is not a lame duck of a Ferrari (think Mondial), in fact it is a phenomenal car and is thoroughly underrated. Also this is not the first time this has happened to Ferraris. Testarossas 5 years ago were around £60,000, today they are over £100,000. Ferrari 550s 10 years ago could be picked up for £30,000 but now you will be hard pushed to find good ones for under £110,000. 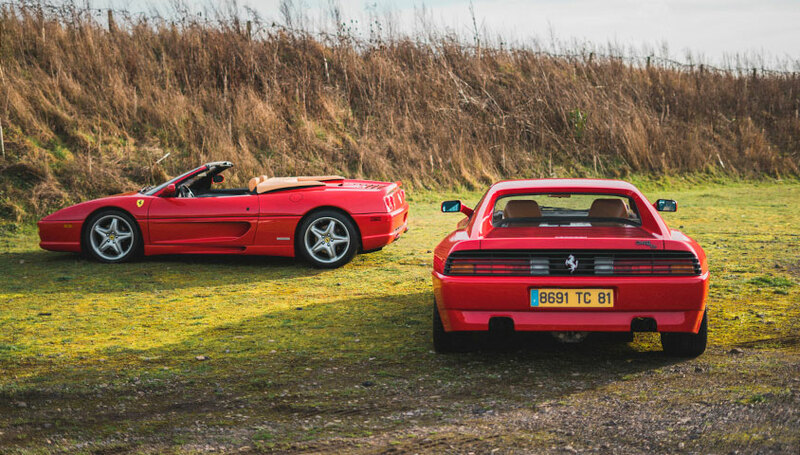 The Ferrari 348 represents a perfect entry-level Ferrari that, with a little help from our friends at Prestige Classic Car Finance, could be a more affordable ferrari than you may think.